Take a pan and add butter to it. When it is hot add almond flakes and raisins. When the raisins pops up add sooji to it and roast it for 10 minutes or until you get light brown colour. The raw smell should go away. Make sure you continously stir it so that the sooji won't get burnt. Now add dry coconut powder and fry by stirring it for 3-5 minutes. Then add sugar and stir it for 2-3 minutes. Finally before turning off the stove add cardamom powder. After turning off the stove add the milk and mix it. The mixture will be tight. Let it cool for 5 mins and start making ladoo. Make sure you don't put too much milk. You should be able to gather the mixture and make a laddu. You can also sprinkle water or milk on the mixture for making a laddu. Make sure to put a bowl of cold water so that you can dip your hand in the cold water and then a make a laddu. By dipping in cold water and then taking the mixture into hand will also make the task more easy because this wetness will be helpful for binding it easily. Here I used milk because it will be more tasty. Otherwise you can also divide little milk and little water instead of only milk. Or you can only use water instead of milk. After turning off the stove you can also sprinkle milk or water on the dry mixture and make laddus or you can add some milk immediately after turning off the stove mix it then make the laddu's. See whatever is comfortable for you. I got 40 laddus by that measurements. So if you don't need that many you can reduce the quantities. You can also adjust the sugar as per your taste. what a coincidence! i made these ladoos today! Wow Looks awesome !I love the new look of your blog.Very Beautiful. 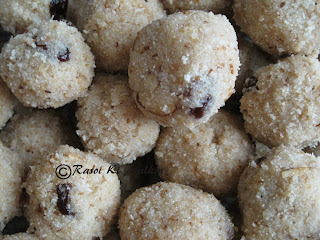 These are one of the best looking rava ladoos I have seen..thanks for sharing!! What a tempting pic dear, love the presentation. Lovely and delicious Ravva Laddu recipe. They looks beautiful.I am first time here,you have nice blog.I like to invite you visit my blog. Looks so delicious. First time here, love all your recipes. Rathu, blog kotha look adaragotesavu... nice work!! loved the color combo and header image.. Aunty must be so happy now!